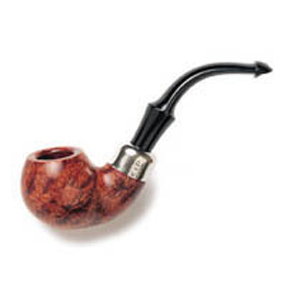 Peterson pipes are one of the most popular pipes in britain today. Best known for their system pipes which have a unique dry system and the special 'P'lip which helps you grip the pipe in your teeth. A few years ago Peterson of Dublin offered only a small range of pipes. Nowadays they offer a wide aray of designs and finishes. Friedrich & Heinrich, who christened their shop simply 'Kapp Brothers', soon made a name for themselves making and selling quality Meerschaum and Briar Root pipes. In the year 1875, Charles Peterson, a large young Latvian immigrant from Riga in his early twenties, walked into the Kapp Brothers Grafton Street premises with a revolutionary pipe and ambitious plans for the future. Declaring to the brothers that he could make better pipes than they could. Armed with an imaginative flair for making pipes and a craftsman's background. There and then, Peterson suggested that the brothers go into partnership with him to turn his innovative pipe dream into the world's dream pipe. They agreed and Peterson not only proved himself correct, but became the third partner in the fledgling firm. The company was then renamed Kapp & Peterson. Thus the legend was born!